… a DO NOT WALK sign. I started running regularly again about a month ago. It’s been brutal. How can a person get SO out of shape in SO little time? The only thing saving me from a spectacular syncopal episode right there on the sidewalk is the 2 busy streets I have to cross (or more accurately their crosswalks). When you’re running, there’s nothing more glorious than coming up to the crosswalk and seeing the flashing red hand and DO NOT WALK. Never mind that it would only take me 4 seconds to cross and the count down says I still have 22. Never mind it’s rush hour traffic and I’m wearing spankies. Never mind I’m standing there grinning, sucking oxygen, and tapping my foot to the music. You see, this little crosswalk break has given me 105 seconds to rest and recoup. It’s the only way I can legitimately take a break. If I stop for any other reason, all those passing cars and the other runners will know. They’ll know I’m out of shape. They’ll know I need a break. But, with all positive things, there’s also a negative. Nothing is more devastating than reaching the street, anticipating your mini-break, then having the DO NOT WALK immediately turn to WALK. No break… and I really needed that break. I have two ideas...one, you can start running with me and then breaks will be perfectly legitimate or . . . two, get a jogging stroller and take Houdini out, under the covers of course, and stop every now and then and readjust things or feed her a strawberry. You know me. 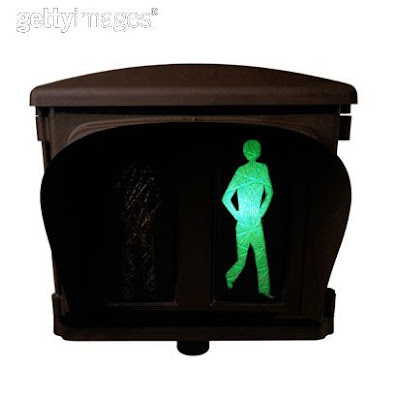 Always good for an idea; not necessarily good ones however, but I think these would work and be much more reliable than depending on a DO NOT WALK sign. I'm with Jane and the jogger stroller idea. Besides a great excuse, it will be such valuable practice. Good job on the running, though. It takes some real dedication to run in rush-hour traffic. That alone would be reason enough to make me pause! I totally agree that a DO NOT WALK sign is a (out of shape) runners best friend. Every morning when I get to the high school corner, I'm so glad that the rush is on and I HAVE to stop. I can always count on a little break there!